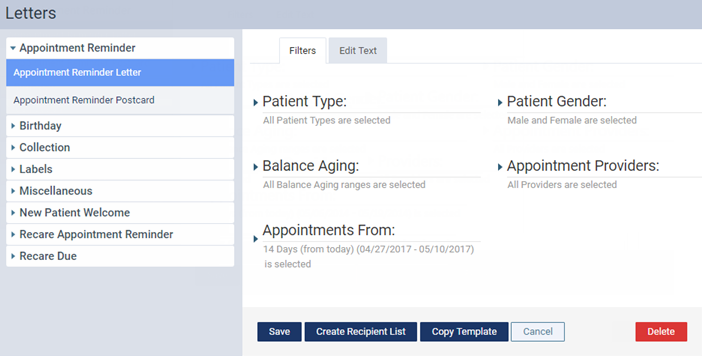 Using criteria filters you specify, you can generate a recipient list of patients who should receive a letter or postcard that contains patient and practice information that has been merged into a letter template. On the Letters page, select the type of letter template that you want to create a recipient list for. You can choose from the following types of letter templates (which are contained in sections that you can expand and collapse): Appointment Reminder, Birthday, Collection, Labels, Miscellaneous, New Patient Welcome, Recare Appointment Reminder, and Recare Due. Change the filters and/or content of the letter template as needed. Click (or tap) Create Recipient List. A progress indicator appears as Dentrix Ascend processes the letter merge, and then the Recipient List appears. Select or clear the Print check box at the top of the list selected to include or exclude all patients who are listed, or select or clear the Print check boxes next the names of the patients who you want to include or exclude. Click (or tap) Print Selected to view the letters or postcards for the selected patients as a .pdf file that you can print or save. If applicable, click (or tap) Print Labels to print mailing labels to put on envelopes or postcards for the selected patients. Is there a way to create a doctor's note? Is there a way to print appointment cards?